After spending a scorching day on the flats, Jeremy and I sat down the other evening to dinner and a movie in our living room. We don’t watch a lot of movies and there was a long list to choose from online. Both our brains were fried from the heat and a long day, so we agreed on The Lego Movie. We loved it. And now I have that song “Everything is Awesome” in my head. But you know what? Everything *IS* awesome. Jeremy left for an out-of-town meeting on Saturday morning. I always worry that he’ll get stranded on the tarmac and starve, so I packed him a brie, prosciutto, and mixed greens sandwich on a baguette. And an apple. And potato chips. And some cookies. And a chocolate croissant. He departed for the airport late enough in the morning that it was already too warm for me to do a long trail run, but it was still early enough to grab a hike under wonderfully cloudy skies. So we drove in opposite directions from our neighborhood and I hiked into the high country. It’s been dry here, which would explain the utter lack of mushrooms (of any kind) on the trails of late. I’ve been scoping my huckleberries as well as the mushrooms. We need rain. They need rain. The mushrooms demand it! I hoofed it up the trail at a good clip singing “Everything is Awesome” in my head. About an hour up, I approached a bend in the trail. My eyes are always scanning the woods around me for mushrooms, for wildlife, and for people (it’s the people you have to watch out for). I hadn’t encountered anyone all morning until a black bear stepped out of the forest onto the trail 20 feet in front of me. It had a full, healthy, black coat and looked to be an adolescent bear, slightly taller than a Great Dane and much fatter. My face lit up as I froze in place to avoid startling it. My gut instinct was to reach for my camera, but it was in my backpack. It hadn’t seen me yet. The bear was looking uphill as it strolled across the trail – doo dee doo dee doo. Then it casually turned to look around and spotted me. My presence gave that poor fellow a start and then the bear high-tailed it straight into the woods. There was a huge smile on my face and I looked around to see if anyone else had seen the bear, but I was alone. It was my first bear sighting in our local mountains (I’ve seen them in town – sad…) and it was the healthiest, most handsome black bear I’ve ever seen. Note: black bears can be black, brown, cinnamon, even buff in color. I took a few steps forward to check if it was hanging out in the woods, but it was far away. And then I spotted my first porcini of the season. EVERYTHING IS AWESOME. Jeremy was concerned that I would be sad and missing Kaweah in the house by myself. I do miss her, but I only tear up once or twice a day now. My folks came over for dinner Sunday evening because they think terrible things will befall me when Jeremy is out of town. I greeted them with a recipe that I had been wanting to make for years. 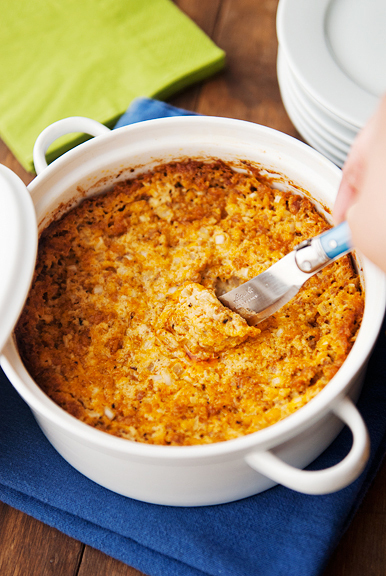 It’s Todd and Diane’s adaptation of their awesome sweet onion dip and it is just as cracktastically addictive. 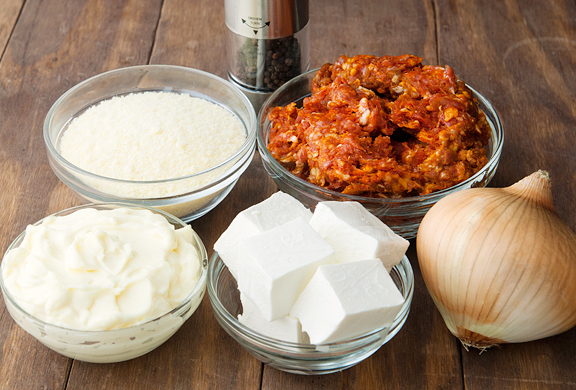 You will want to make or buy uncased or bulk chorizo – basically not in sausage form. It only takes a few minutes to brown up. Drain off the excess fat and set the chorizo aside. 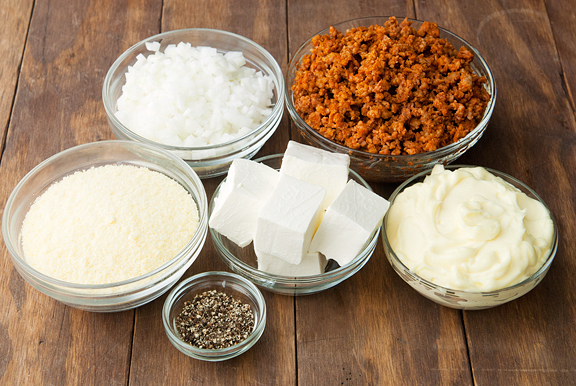 Trust me, there is more than enough fat in this recipe that you won’t miss that little bit. 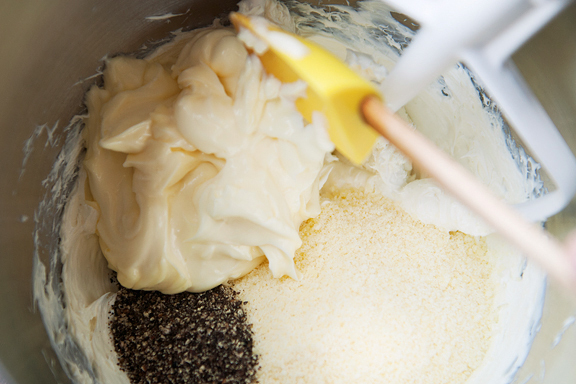 Beat the cream cheese until it is smooth and then mix in the cheese, mayonnaise, and pepper. See how easy that is? 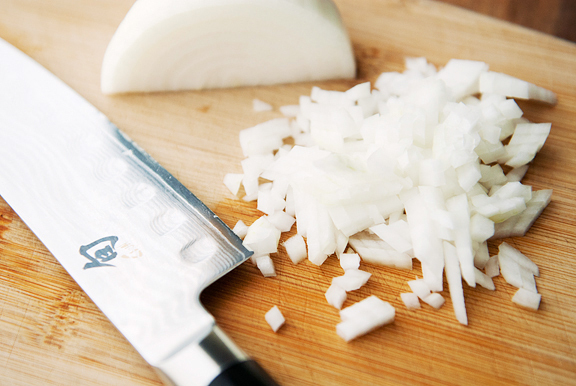 If you like chunky onion (more crunch), then go for a medium dice. I prefer my dip to have a finer onion texture, so I dice it small (about 1/4 inch). You can beat the onion into the dip or fold it in to avoid crushing any of the onion. I also fold the chorizo into the dip. This recipe makes enough for an 8×8-inch square baking dish or a 9-inch round baking dish (think pie dish). Or you can use random shapes and sizes to suit your purposes like I did. Diane had told me I would love this version and she was right (she’s always right). It’s spicy and more substantial than its parent recipe. I served it with flour tortilla chips, but it is just as good with corn tortilla chips or crackers. My folks liked it a lot. In fact, they complained they liked it too much! I think that’s a good sign. 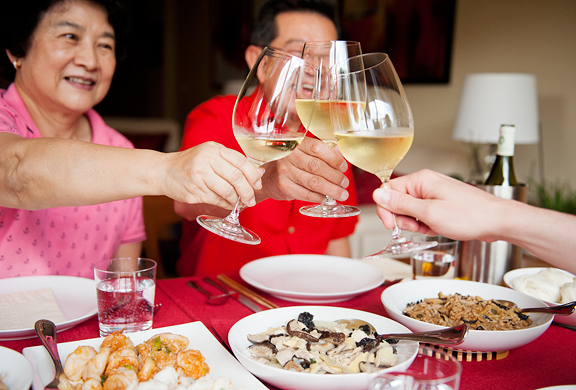 So keep this one in mind for your next party. Awesome. Preheat oven to 350°F. Brown the chorizo in a frying pan over high heat until completely cooked. Drain off the excess fat and set the chorizo aside. 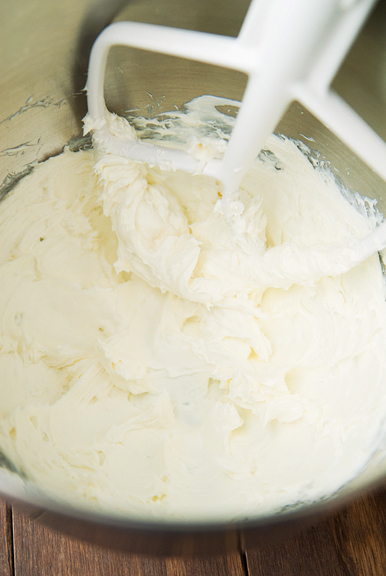 Beat the cream cheese until smooth. Beat in the grated Parmesan, mayonnaise, and black pepper. Stir the sweet onion and chorizo into the cheese mixture. 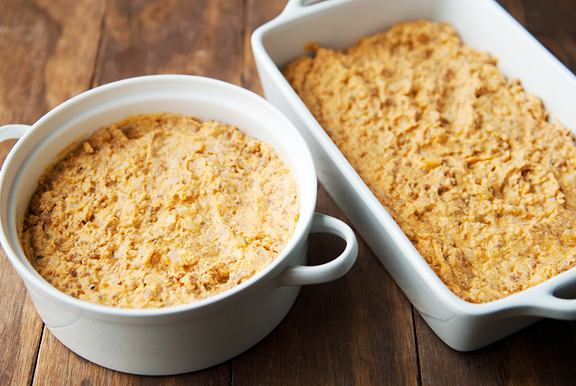 Pour the contents into an 8×8-inch baking dish or 9-inch round baking dish and smooth the top. Bake for 35-45 minutes or until brown and bubbly on top. 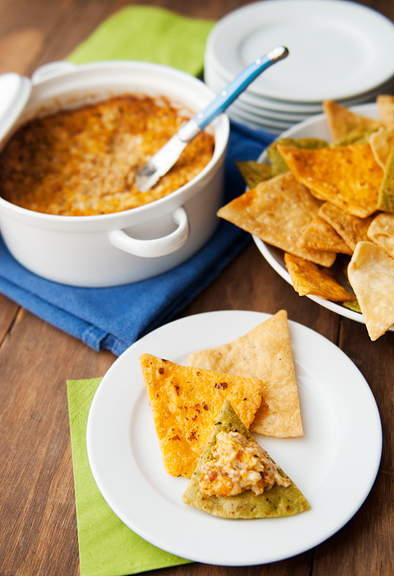 Remove from oven and serve hot with crackers, corn or flour tortilla chips, or crostini. Serves 12+ as an appetizer. 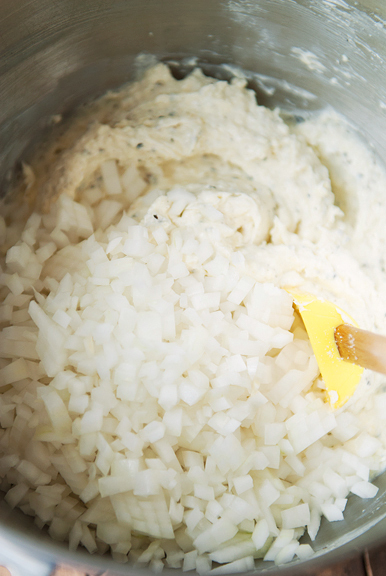 I rarely ever make Todd and Diane’s sweet onion dip, because I will eat the entire freaking batch… and this sounds even more amazing! If I ever have anyone over again, I will be making this. omg! Just before heading to bed and getting ready for my second finals tomorrow, I knew I would get a recipe from you. And we also rented the Lego Movie this weekend, too, BUT the redbox machine was out of order. The hubster buster came home empty handed…..now I REALLY want to see that movie after my third and last final exam! So glad you’re feeling AWESOME again! 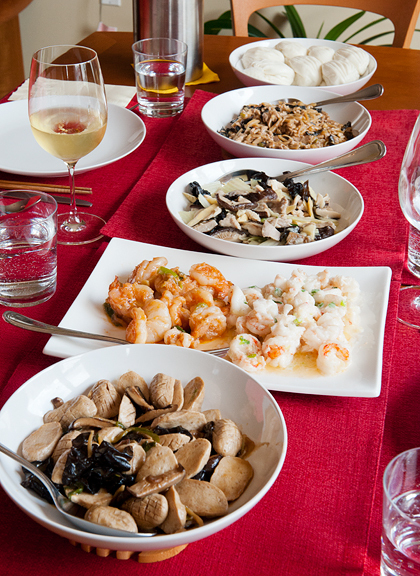 I saw at the end of the table…a basket of mien boa! yum…. I recently came across your incredible story and wanted to be connected to your world. Hello! I am introducing myself to you. I am Robert Fujii and I want you to know that your universe is beautiful. Thank you for the privilege to look at life with you. With respect and a salute. You do sound awesome! We are in CO for a family reunion, and will be taking one last hike this am…I guess I can stop worrying about bears if you’ve only run into one on the trails! Jennifer, I know the recipe calls for bulk sausage, but I wonder if the soy choizo (in casings) might work? Have you tried it? It’s great in egg dishes, etc and you’d never know you’re not eating the real stuff. Might have to try to sub it, just hate wasting food if it doesn’t work….If I do try it I’ll be sure and send you info. Keeping this one on file for fall football season! this looks SO delicious and beautifully captured to! love your step by step instructions. 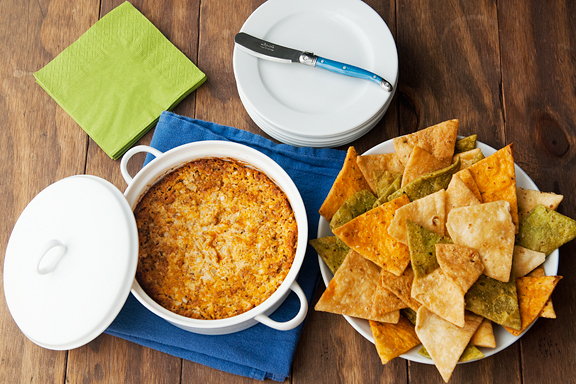 definitely recreating this dip in my kitchen this weekend as i have a housewarming party to throw and appetizers to provide! this looks so good. you always post the best dips! I loved your onion dip. I can’t wait to try this out. I’m glad you had an awesome day! And today it is raining. Hurray! Love this dip. I’ve made it without the chorizo and it was awesome that way. Can’t wait to try it like this! Wish I had folks that cooked like yours! I was driving home about 2 years ago in the afternoon from my oldest son’s house who lives in the country and low and behold I spotted a black bear! It was an awesome sight for sure!!!! 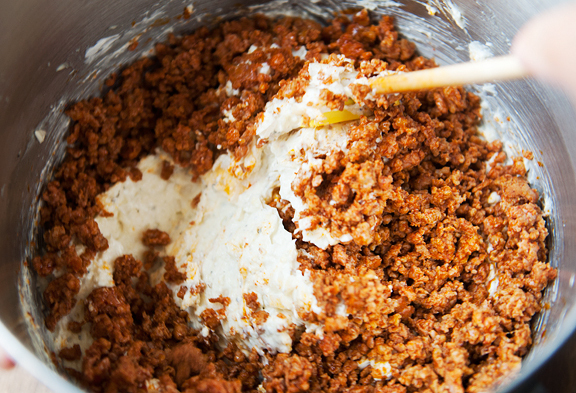 Chorizo crack dip? I didn’t know crack dip could get any better. Must resist [for now] as I had crack dip just last week! You are so brave with the bear! I think I must have gasped out loud when I read that part and if it were me out there I would have melted into the ground! Glad your day was awesome, and as nervous as I am around bears, it sounds like you life in one awesome place! Ok, this recipe it getting bookmarked, highlighted, and place on the fast track for making…I don’t know if I can wait for a party! I just giggled at the amount of food you pack Jeremy! Hope he’s flying first class, as that is a first class meal! 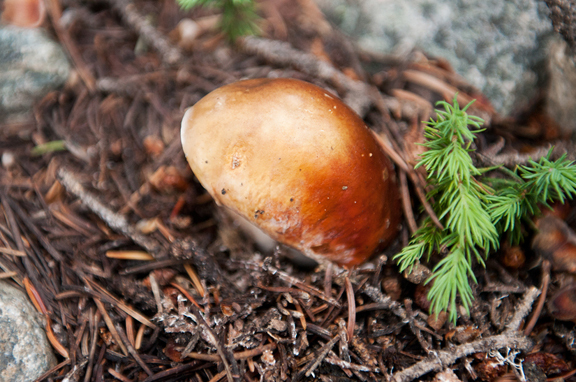 I believe all mushrooms should be named with male names. Miguel is beautiful. Do you carry bear spray, just in case? Be safe. Now that song is in my head too. So . . . thanks for that. Three boys here at my house. That movie has practically been on a constant loop for a month. What wonders one gets to see in the woods! That dip looks amazing, did you offer some to the bear? I love hearing about what you had packed for Jeremy for his travel. Many a times, I have no clue what to pack and end up paying a lot for food that is not worth the price. Thank you for the idea! Would love to hear more of those and picnic/lunch ideas! Pey-Lih – I hope you got to see the movie eventually. It’s sooo cute! Kristin – oh, I hope your last hike was great. And seeing a bear is generally a harmless experience. They are quite shy around our neck of the woods. 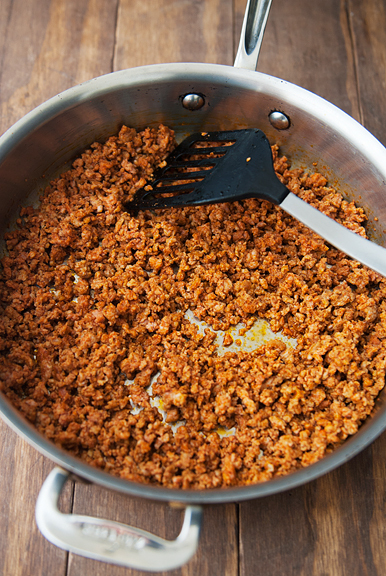 Denise - I haven't tried soy chorizo (I try to limit my soy consumption because of my history with breast cancer), but if it is in casings, you can just break them open and crumble the filling into the pan to cook. Should work fine. Thalia - wonderful, I hope it was a hit! christina - thank you, but really, the credit goes to Todd and Diane! jill - oh, Jeremy is a professor at a state university. He flies coach, which is why I make such nice food for him - to sort of make up for flying coach ;) And no, I don't carry bear spray (a backcountry ranger in Glacier NP in Montana told me that he only ever used bear spray once and it was on a moose - and it did nothing). Bears in Colorado are pretty harmless. And I can do a lot more damage than bear spray to a bear if necessary (but I'd rather not ever hurt a bear if I can avoid it). Wendy - any sandwich that isn't messy works well (egg sheet, bacon, and cheese). I like fruit too. Crackers. Chocolate. Nuts. Dried fruit. Larabars. Food on the go that provides energy without being too heavy. I make my own chorizo and I think it would be amazing in this. Thank you. 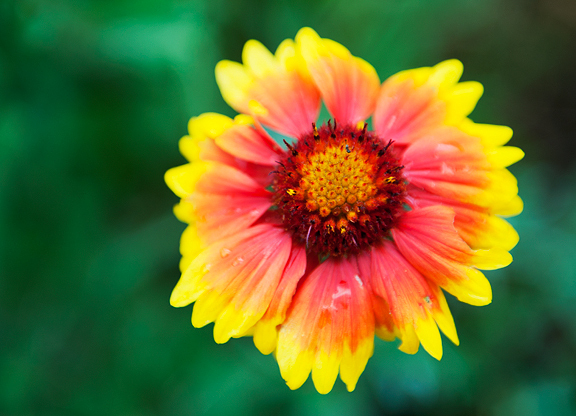 Made this last night and it was a huge hit…..Thanks for sharing!